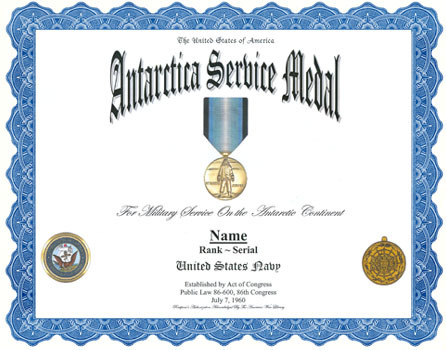 An unaltered photocopy of your DD-214, OR WD AGO 53-55, OR other military issued document clearly displaying your Antarctica Service Medal award or eligibility. 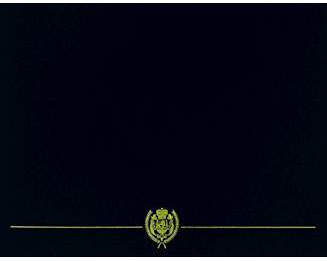 The Antarctica Service Medal was established by Act of Congress (Public Law 86-600, 86th Congress) on July 7, 1960. Administratively, the Antarctica Service Medal is a Department of Defense service medal. This medal was authorized by Public Law 86-600 on July 12, 1961, and the design received final approval in 1963. It is awarded to members of Antarctic expeditions and personnel of the permanent Antarctica stations or for service in contiguous waters, starting with the United States Navy Operation "Highjump" under the late Rear Admiral Richard Byrd in beginning 02 January 1946. It is awarded to officers and enlisted men of the armed forces and to deserving civilians, such as scientists and polar experts. Subsequent to 01 June 1973, a minimum period of 30 days of service at sea or ashore south of 60 degrees latitude was required. Each day of duty at an outlying station on the Antarctic continent will count as 2 days when determining award eligibility. Effective 01 July 1987, flight crews of aircraft providing logistics support from outside the Antarctic area may qualify for the award after 15 missions (one flight in and out during any 24-hour period equals one mission). Days need not be consecutive. A "Wintered Over" clasp is awarded to those who have spent the winter months (March through October) in Antarctica. A bronze clasp (or miniature Antarctic continent device on the service ribbon) signifies one winter; gold two and silver three or more winters. This medal is a continuation of the series of medals established by Congress to commemorate polar expeditions. Specifically, it is awarded to any member of the Armed Forces of the United States, any U.S. Citizen, or any resident alien of the United States who, after January 1, 1946 has served or serves on the Antarctic Continent or in support of U.S. operations there. No minimum time limits for participation at sea or ashore south of latitude 60 degrees south were required prior to June 1, 1973. However, since that date a minimum time limit for the award has been set at 30 days. Each day of duty at any outlying station on the Antarctic Continent counts as two days for determining award eligibility. Flight crews of aircraft providing logistics support from outside the Antarctic area will receive no more than one day's credit for flights in and out during any 24-hour period. The days counted toward eligibility do not have to be consecutive, and flight personnel may earn the medal based on fifteen flights into the area. The Antarctica Service Medal is worn after the Korean Service Medal and before the Armed Forces Expeditionary Medal. NOTE: These clasps are represented on the service ribbon by bronze, gilt, and silver discs 5/l6ths of an inch in diameter with the Antarctic Continent's outline inscribed thereon. The Antarctica Service Medal was designed by Rawson K. Moore and sculpted by Thomas Hudson Jones(1892-1969), both of the Institute of Heraldry. The identity of the first award of the Antarctica Service Medal was not recorded. In the center of a bronze medallion one and a quarter inches in diameter, there is a view of a polar landscape on which stands a man in Antarctic clothing, between the horizontally placed words ANTARCTICA on the viewer's left and SERVICE on the right. The man is standing erect; his eyes on the far horizons, standing with his feet in an attitude of stability and determination; his arms extended and his hand closed. He represents those attributes of courage, devotion, and sacrifice that exemplify the best traditions of Antarctica service. The uniform is that worn by Admiral George J. Dufek, who led an advance party in 1956 to build the first permanent station on the South Pole; the hood has been thrown back to suggest readiness for instant action. The vast empty regions of the polar landscape are conveyed by the distant mountains. The modern bold letters emphasize the aggressiveness of the scientific aspects of these expeditions. In the center of a bronze medallion one and a quarter inches in diameter, the Continent of Antarctic from a polar projection with geodesic lines, across which are the words, COURAGE / SACRIFICE / DEVOTION, all within a circular decorative border of penguins and marine life. The decorative motif of the border symbolizes the marine life of the area. Forming a complete circle, it alludes to the unity and teamwork needed to insure success of the expeditions and also refers to the thoroughness of scientific endeavors. The words reflect the high standards of the men assigned to the expeditions. The outer black and dark blue bands make up five twelfths of the ribbon and represent the five months of total darkness, while the graded center comprising seven-twelfths of the ribbon represent the seven light months and the Aurora Australis.